It is 5.30 am in the morning, still dark, sitting in my car on Hyperion, waiting for the billboard to be installed. The city is still quiet, from time to time a car passes by, in my back, I can see the sky getting lighter. The billboard proposes to me to take a shot of tequila, I am tired. In the twilight, I feel even more part of the urban landscape of LA. I am looking at it, it is looking at me. Opposite a restaurant, I like the atmosphere in. I am thinking about my year coming to an end in LA. It will still be here, when I will be gone. And that makes my departure somewhat lighter. Looking at this still reminds me of a common film scene, what am I looking at? Thought through my eyes, immediately the sounds of the city become apparent, when saying this sentence. Birds becoming more and more active, cars driving by, air conditioning running, it is pretty warm for this day time or night time, still a bit damp. At this moment, the billboard wants something from me. 5.38 am, the sky’s color is turning blue, and already there is a stream of cars. A guy is cleaning the pavement with a hose. The street lights are going off, I can see more detail in the surroundings. They are coming more towards me. The cables draw lines in the sky, it seems so improvised. Maybe this is what I like about my LA. Everything seems transitory. It is great being on the street so early. 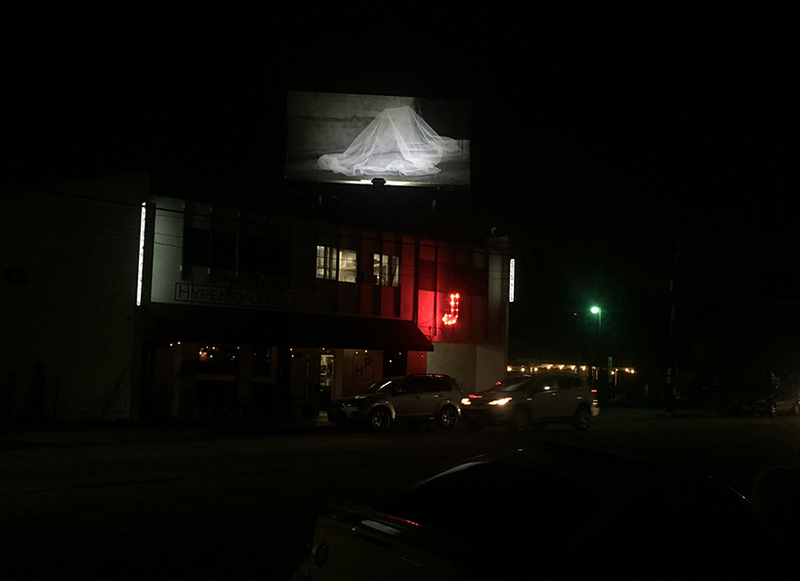 The lighter it gets, the more the billboard merges with the surroundings. At night, the city is its stage. In day light, it is part of the city, of the urban landscape. I am hungry. 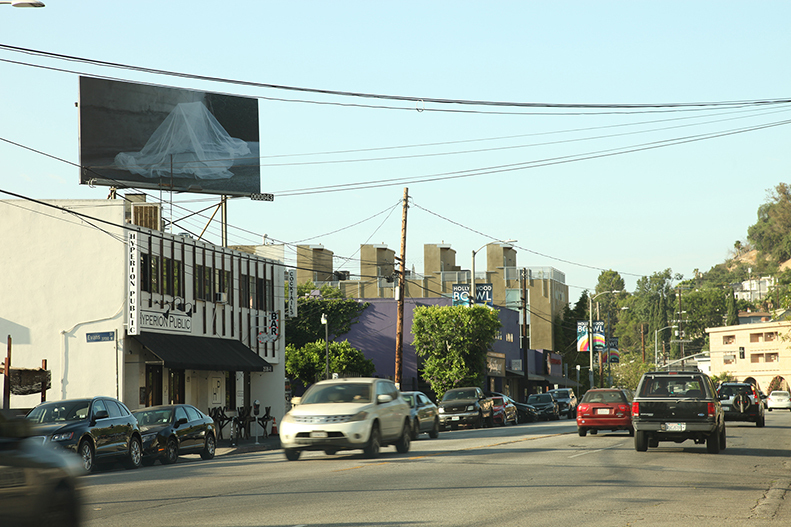 I see a ladder reaching to the billboard and a pole reaching across the image, I wonder if it was there before. I check the camera. Yes, it has been there all the time. I look into the side mirror of the car, pink lit puffy clouds, reminds me of the St. Mark’s Square at the Venetian in Las Vegas, unreal, here not. 6.24 am will it ever go up? It is daylight, people jogging, walking their dogs, routine starts. Shortly quiet. Birds sing, the lush greens growing out of every corner, not trimmed. A palm tree leaning into the street. And again a stream of cars rush by, the car shakes. My last week here has started, next Monday this time, I will be on my way to the airport. 6.56 am sunlight on the street, the stream of cars hardly breaks anymore, a continuous flow. The birds still find their moments. I love this city, being part of it. A continuum of moments. 7.18 am the billboard is in the shadow, the white wall of the building gleams. I see a truck with a ladder on top parking, two men in orange. Suddenly. My heart is beating. I quickly get out of the car, get the camera ready and start filming. And yes, they climb the building, onto the scaffolding, one on top, one below, and unfold the material. The image slowly appears from left to right, wonderfully analog this process, I think. They spot me filming and seem to smile, I smile inside. Again a moment, relief, not sure what about. It is there, I am here. And like a cloud it floats above the building, a LA cloud. Now, it is not wanting, it gives a place. The orange guys climb down, one takes a picture with his mobile, they wave to me across the street while driving off. I wave back and stay. The image of a transparent man-sized tent now hovers over Hyperion opposite Speranza.